MELAtronic sterilizers are compact, robust and durable. On the market for several years, the reliable technology of MELAtronic steam sterilizers has proven its worth many times over. General practitioners, podiatrists and veterinary doctors have all taken advantage of the cost-effective steam sterilizers of the MELAtronic series. A robust sterilizer with fractionated flow procedure. The microprocessor control of MELAtronic 23 EN permits reliable sterilization results and simple operation through a fully-automatic program control. Practice-optimized for use in medical practices and clinics with low levels of instrument use. The compact steam sterilizer with fractionated flow procedure and active drying ensures safe sterilization and drying results. High levels of quality and reliability, especially designed for the needs of veterinary practice. Monitoring of the program run by the electronic system ensures that MELAtronic 23 provides reliable sterilization results. MELAtronic 15 EN+ is validatable and fulfils the high requirements placed on Class S procedures established in international standards. The sterilizer uses a fractionated flow procedure. The alteration of steam injection and pressure release evacuates the air from the sterilization chamber and the hollow body articles amongst the sterilization material. 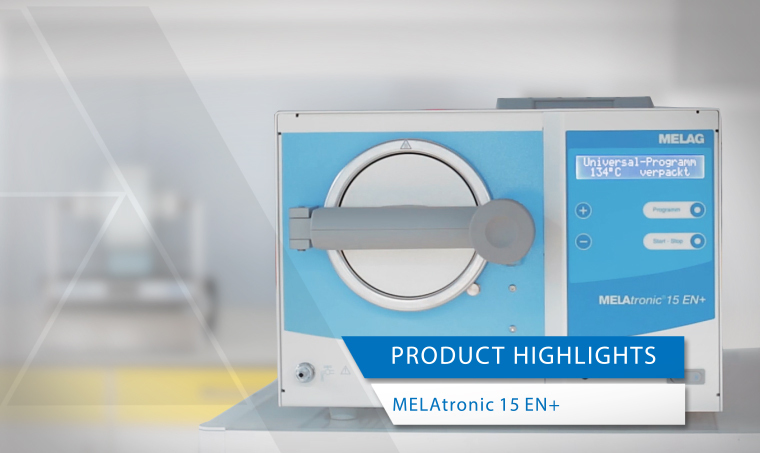 MELAtronic 15 EN+ is also fitted with active drying and a fully-automatic program run via the microprocessor control. This equipment guarantees a maximum of process reliability and reproducibility of the sterilization parameters. MELAtronic 15 EN+ is validatable and comes equipped with integrated active drying, making it the ideal device for podiatrists and medical practice. The sterilizer is suitable for cost-efficient sterilization as required by general practitioners and other medical practices, whose instruments do not require a Class B steam sterilizer. The fractionated flow procedure of the Class S even guarantees the decontamination of simple hollow body instruments such as scissors, forceps and clamps. The sterilization chamber of the MELAtronic 15 EN+ is ideally suited to medical practices with low levels of instrument use. General practitioners in particular have reported high levels of satisfaction with the chamber concept. The compact dimensions of the chamber combined with the mount for up to three trays means minimum consumption per sterilization batch. Instead of investing in ever-more disposable instruments, the affordable operating costs of a Class S steam sterilizer justifiy the purchase of re-usable instruments. MELAtronic 15 EN+ can also be operated in extremely instrument-protecting single water use procedures to contribute to the value-retention of your instruments. The sterilization process is documented via the connection of a corresponding documentation medium to the serial interface of the steam sterilizer. MELAtronic 23 and MELAtronic 23 EN provide the perfect solution for the reliable sterilization of equipment used in veterinary practice. The protection of staff and patients and the functional and value-retention of instruments is just as important in veterinary context as a medical context. The high-quality components and stainless steel chamber of the MELAtronic series ensure the usual MELAG reliability. The MELAtronic 23 offers two sterilization programs: one for quick instrument sterilization at 134°C, and another for the sterilization of temperature-sensitive instruments at 120°C. MELAtronic 23 EN provides even more: As with the MELAtronic 15 EN+, this device uses a fractionated flow procedure in accordance with international standards. This steam sterilizer is also fitted with high-quality temperature and pressure sensors and a microprocessor control. This ensures a fully-automatic sterilization cycle. An integrated water quality measurement system, a water level switch and a two row display permit easy-to-use operation of the steam sterilizer. MELAtronic 23 EN is also fitted with a serial interface, which permits direct connection of the MELAprint 42 log printer, a MELAflash CF card printer or MELAnet-Box to a PC or practice network.